Last weekend I needed to make a jaunt up to Oshkosh Nebraska for a baby shower. 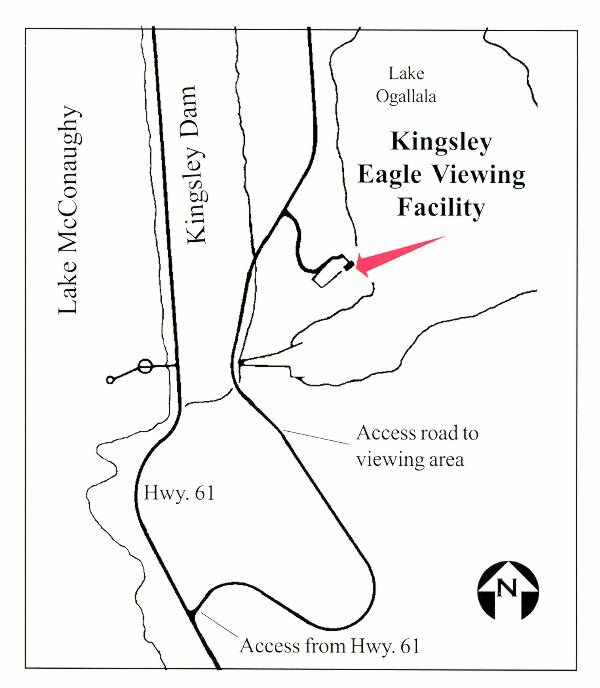 I decided to take advantage of the road trip and stop by the Eagle Viewing Facility hosted by the Central Nebraska Public Power and Irrigation District at Kingsley Dam. The facility is actually below the dam and Lake McConaughy on Lake Ogallala. To get here, you head north out of Ogallala on Highway 26. When you get to the junction of Highway 26/61, turn right (east). Just past the Water Information Center, but before you cross the dam, you'll see a sign pointing right to the Eagle Viewing Facility. The snow had mostly melted, off the roads at least, the day I went, but I might be hesitant to make this drive in a car. An SUV would be fine. It's a gravel road that winds down a steep hill and crosses the spillway below the dam. If it's snowpacked, icy or muddy, cars might have a problem. If you think you're going to have trouble getting back up the hill, you can leave by exiting to the north and accessing Keystone Lake Road to get back up to Highway 61. As you approach the Eagle Viewing Facility, please use caution so you don't spoil your and the other birdwatchers' enjoyment by making too much noise, or leaving the silhouette of the building, which will scare the birds. Inside, you'll find that you're going to be nice and cozy, sharing the space with likeminded people in the company of an extremely knowledgeable representative of CNPPID. There are binoculars and spotting scopes to borrow, so don't worry if you didn't come prepared. Even though this is the height of the eagle wintering in the area, it was uncrowded on a Saturday afternoon. So, just what is everyone looking at? Across the bay on the point, you can see eagles and a dense concentration of swans. This day the CNPPID employee had counted 76 eagles and 35 swans. Last week, the eagle numbers were in the 30's. According to him, this has been one of the best years so far for numbers of birds. I had expected the eagles, but the swans were a welcome surprise, as were the thousands of other water birds. I've admitted before that I am no birdwatcher, but the other visitor and the CNPPID representative were more than knowledgeable about the species that were present to make up for my deficiencies. There were thousands of dead fish on the shoreline, which I was told were Alewife. There is a large population in Lake McConaughy, and these travel through the spillway into Lake Ogallala. There is a temperature difference between the two lakes. I'm assuming Lake Ogallala is colder, being smaller and shallower. The fish die from temperature shock, leaving abundant food for the scavenging eagles. The ones that don't die (only about 10% do), provide live food for the ducks, geese, swans and other waterfowl. Directly across from the viewing stand, eagles are soaring above the bluffs and hanging out in the trees, sometimes munching on the fish they've just grabbed. And the Eagles! The numbers are incredible. I know my friend over at Dutch Harbor Dirt gets to see hundreds of Eagles up in Unalaska all the time, but in these numbers, they are rare in Nebraska. According to Nebraska Birding Trails, there are around 35 nesting pairs of Bald Eagles in Nebraska. According to the Nebraska Game and Parks Commission, sometimes as many as 1500 will winter in the state. I could show you picture after picture after picture of the Eagles that were there last weekend, flying, swooping, playing, fighting... but you would just get sick and tired of it. Instead, here is one to give you an idea of how close you can get. Now you've got to go visit yourself! One couple from Colorado that I visited with in the facility are regular visitors, both during Eagle season and during the summer. They said there is a nesting pair around Lake Ogallala. They also related to me that they had stopped in Ogallala for a burger before going out to the lake. They mentioned to the staff in the fast food restaurant that they were there to see the Eagles, and they got an uncomprehending look in return. According to tourism studies, people in fast food restaurants and convenience stores are often the number one go-to sources of information for tourists. It's been my experience, both as a tourism professional and a traveler, that they are often the most clueless when it comes to what's going on locally (the standard answer to that question being... nothin'). When I posted a video showcasing the Eagle Viewing Facility, I was taken to task for this comment, and rightfully so. Not all locals are clueless, and I am so grateful for the ones who aren't! So I'll get off my soapbox and end by encouraging you to get out and see the magnificent Eagles who winter in Nebraska. 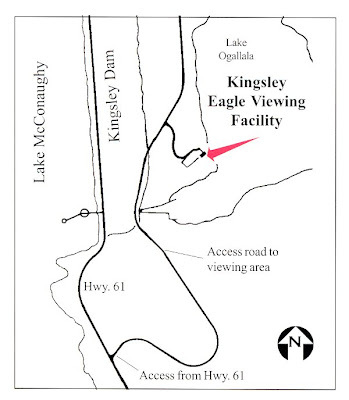 The Central Nebraska Public Power and Irrigation District provides facilities from which the public can watch eagles and other wildlife, including a multipurpose and eagle-viewing facility constructed in 1996 below the south end of Kingsley Dam. 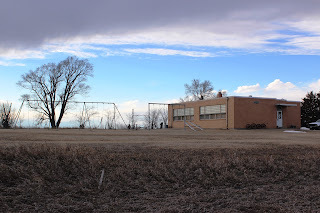 The building is located on the shore of Lake Ogallala and affords a wonderful vantage point from which to watch eagles as they catch fish from the lake, sit on the ice and in nearby trees and soar above the area. Inside the Johnson No. 2 Hydro (J-2), bleachers are situated in front of large windows which look out over the Supply Canal where the eagles swoop to capture fish and rest in the trees along the banks. Spotting scopes are provided and attendants are available to answer questions. J-2 is located about seven miles south of Lexington. Signs along area roads help guide visitors to the plant. There is no charge to visit the facilities. At both sites, it is important for visitors to remain in the facilities while watching the eagles. The birds are easily disturbed and are particularly cautious of humans. Trying to approach the birds or loud noises could frighten the birds from the area. There should be Eagles in the area for about the next month, depending on the weather. 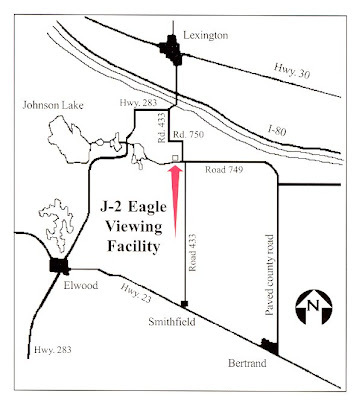 If the site near Johnson Lake would be more convenient for you, here is the map to it: So now you know about the Eagle Viewing Facilities, you know how to get there, and what you'll see after you're there. What are you waiting for? Read your blog on the Eagle Viewing Facility before my sister and I went there on Feb. 3, 2013. It's an awesome place! I certainly was in awe of all types of birds visiting the area! 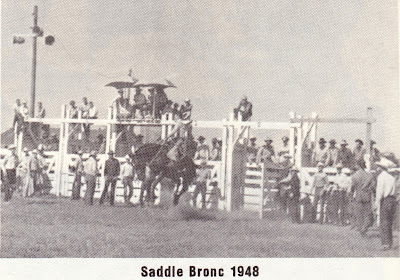 To think that this grand place is in our "backyard" (I live in the Panhandle and my sister lives in NE Colorado)!! 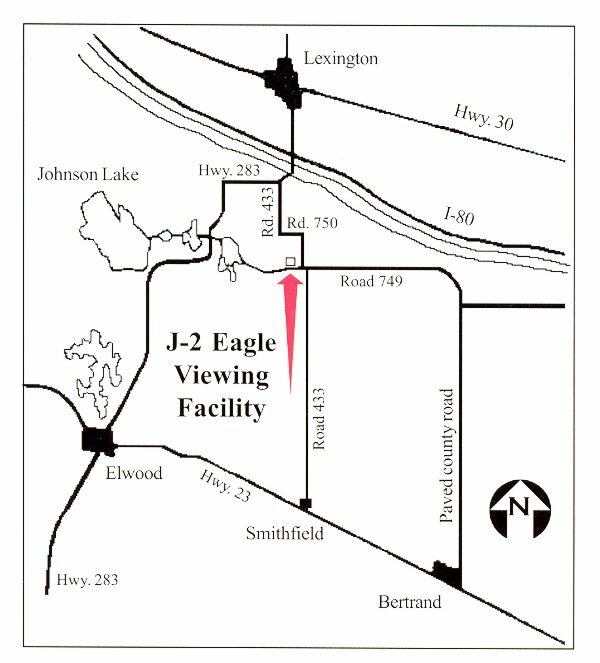 I didn't know it existed until my sister and her husband took a drive around Bic Mac and saw the "Eagle Viewing" signs! Really enjoyed your photos of the facility as well! It's an experience I'll never forget and definitely want to go back in Feb. or March of 2014 to see again! Thank you so much for your kind words Maggie Ann. It really is amazing to see the eagles, and all of the other birds that pass through here on their migration - you should see the Sandhill Cranes! I hope you make it back next winter.